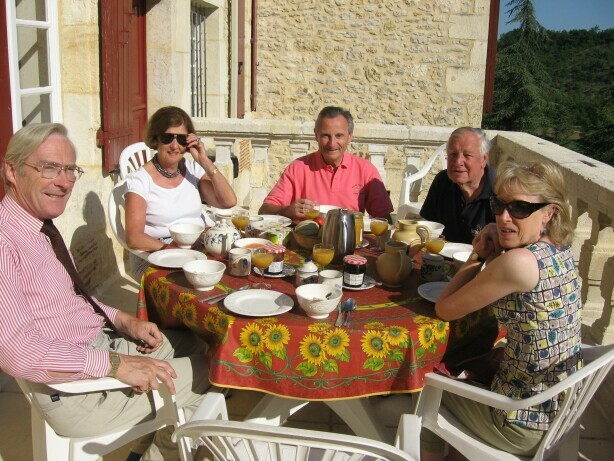 Joanna & Bill began the year with skiing for 2 weeks at Courchevel, with both family and friends, before crossing back to the Lot and Lot-et-Garonne to prepare for the Summer season. In May Trichot hosted another charity concert "Roll Over Beethoven" - a light-hearted tribute to classical music that has found its way into popular culture. 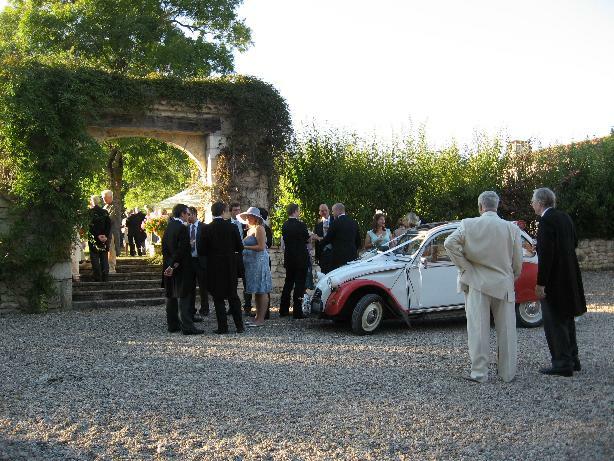 All the chateaux later hosted weddings and other celebrations, as well the usual family groups. Some weddings are managed by professional "wedding organisers", others do their own with local caterers etc from Joanna's list. 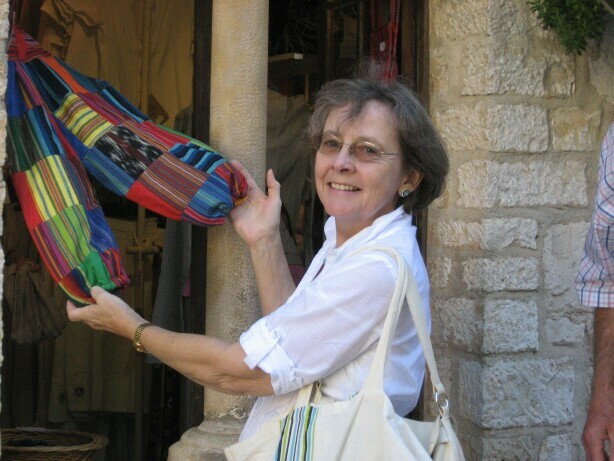 Your testimonials have confirmed that this is the friendliest and most fascinating part of la Belle France ! Many of our visitors have been French families, some of whom came in force for Christmas and New Year to each of the 3 chateaux. 2017's charity concert was very well received - Michael Lunt's professional rendering of Flanders & Swann classics, skillfully linked with Betjeman recitations, made for a highly entertaining evening. We had friends staying with us at Trichot who had driven out from the UK with no less than 4 electric bicycles ! We enjoyed touring our country lanes with them and lost a whole euro by betting they would not be able ride up a very steep hill. They have written up their trip with lots of photos, downloadable if you click HERE. 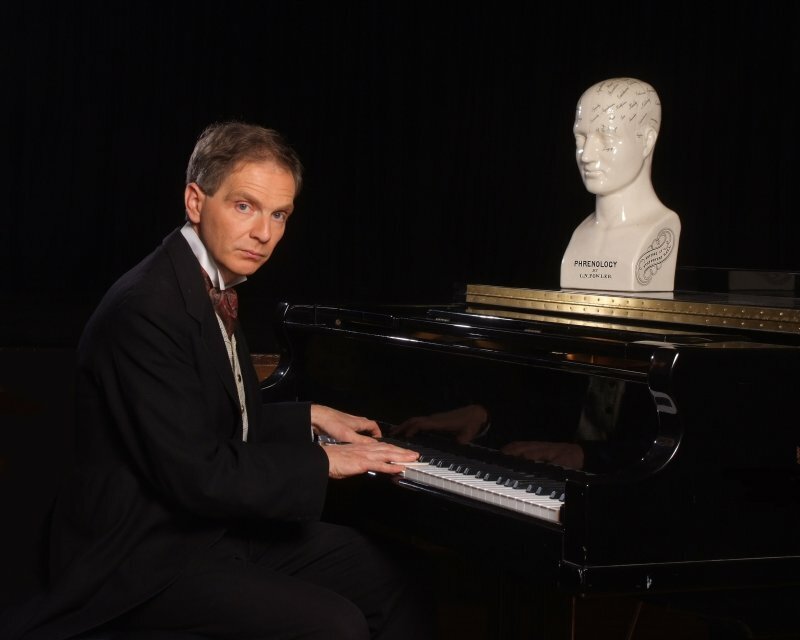 Once again we started our season with a charity performance by Michael Lunts - this time a musical play based on the early life of Serge Rachmaninov - how he went from early successes to rejection and depression, to be cured by hypnotism and then achieve his acclaimed 2nd Piano Concerto - famous as the theme music in "Brief Encounter". 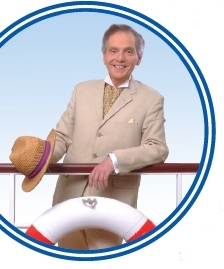 Next year (2017) he will return on 7th May to perform his tribute to Flanders & Swann "Revisited through the eyes of Sir John Betjeman". It was another very hot Summer, there were lots of house parties, weddings and anniversaries. Many thanks to all of you who wrote such kind comments. 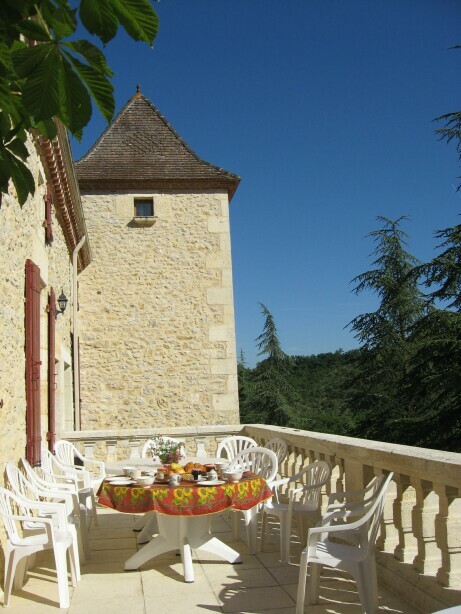 Bookings for 2017 and even 2018 have been coming in early, so Brexit has not affected our appreciation for France's climate and glorious countryside. Lamostonie has benefitted from extra insulation to the top floor and some new double-glazed windows for maximum comfort in both Winter & Summer. Joanna continued to be busy rebuilding the old barn at Lafage - it will be called Lafontaine de Lafage and we are fortunate to have found excellent craftsmen in both stone and oak. Bill has indulged himself with a drone for aerial photography - too late for the Summer but there are some late Autumn/Winter views on Youtube for both Cardou and Trichot. 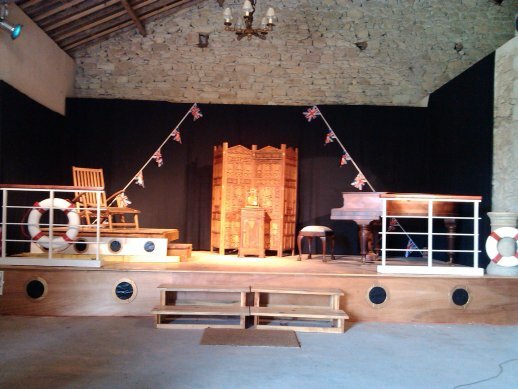 2015 has been a busy year, with Brockhurst School at Trichot again, and a brilliant musical stage performance by Michael Lunts: "Coward at Sea" , based on Noel Coward's 'P&O 1930' - the voyage home from the Far East, with amusing and often touching vignettes of the characters on board, together with the classic songs from that period - Sail Away, Mad Dogs and Englishmen, Singapore Sue and many more. Both Trichot and Lamostonie hosted weddings, and there's a Youtube clip at the bottom of the page with some breathtaking aerial views. In the Autumn we boosted Cardou's Internet to a 22Mb satellite link and reinstated the original telephone, now with a new number: 05 53 71 84 71. Much of the Summer was extremely hot in 2015, so the pools hardly needed any heating, and bedroom fans were kept very busy! In June we hosted another Composer Play-with-Music by Michael Lunts, on the last days of Schubert's all too short life. As usual the audience was captivated by Michael's amazing talent as writer, actor, musician and singer. 2013 has been a bit quieter for us, unsurprising after our 2012 Ruby Wedding extravaganza. We started off with another superb performance by Michael Lunts, this time his second one-man concert/play on the life of Chopin. 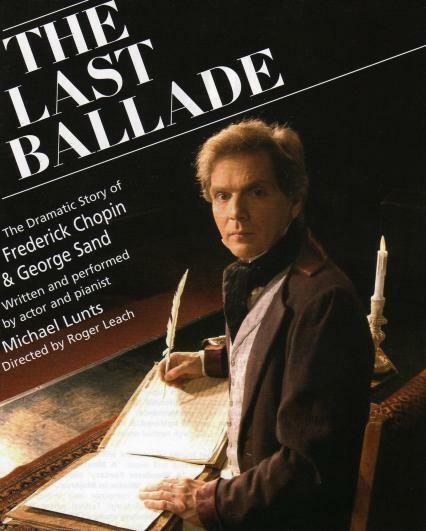 "The Last Ballade" follows his last days with George Sand and his return to Paris, always composing. Once again we had an audience of over 100 and were able to make a significant contribution to the young artists of l'Orchestre du Centre Philharmonique, aka Richard Beswick's charitable music foundation. Members of the admiring audience came up and said they hadn't realised that anything like Michael's productions ever existed - he researches, writes, acts, plays the piano masterfully, and, in other productions, sings! On our side we had fun setting up the stage and concocting Chopin's chest full of brightly coloured medicines. Otherwise we can point to some improved garden furniture at Cardou and Lamostonie, and a long awaited handrail for Trichot's great stone staircase. Being wide and gentle, no-one has seemingly needed one over the several centuries that it has existed, but finally we succumbed. The recently refurbished cottage has greatly increased Trichot's popularity, as it can sleep an extra 6 in 3 bedrooms, plus independent living space with TV and kitchen. Also the Party Barn, as well as hosting the concert, has again come into its own for weddings. We have enjoyed wonderful family holidays ourselves, with our married children, our grandchildren, cousins and friends. Finally, that little derelict barn, tucked away below and out of sight of Farmhouse Lafage, is finally (after 40 years) being rebuilt into what will hopefully be an attractive stone house. 2012 was a big year for us, both for the holiday properties and for us personally. 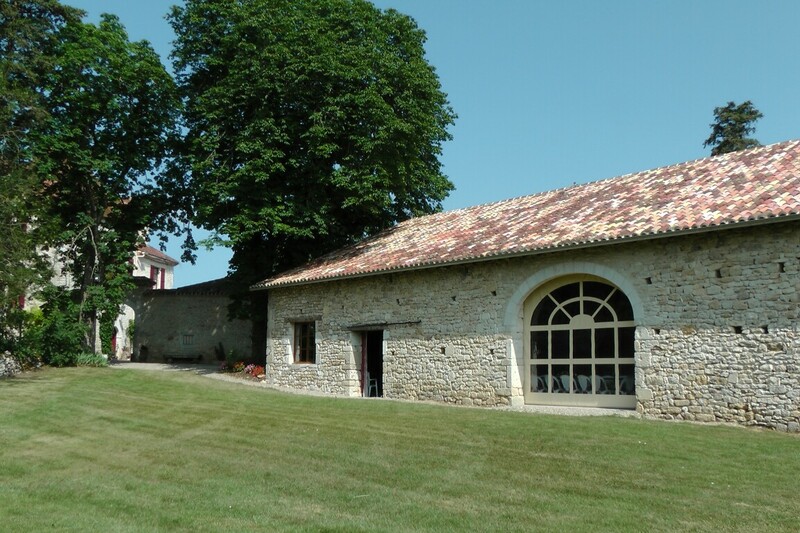 After some splendid Jubilee celebrations with the ex-pat community we celebrated our Ruby Wedding with 150 friends and relations, using the newly refurbished barn next to Chateau du Trichot. We now feature this huge entertainment area on the Trichot web pages, and hope that it will be appreciated for other people's celebrations, as there is no longer any need to hire a marquee for anything up to 200 guests. 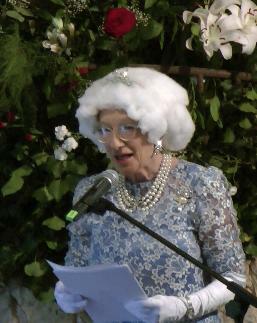 We were entertained by Michael Lunts (you can find him easily on the web) with an evening of Noel Coward, Tom Lehrer, Flanders & Swann and other songs, and there was a brilliant surprise introduction by Her Majesty the Queen, performed by our friend Amanda Duke-Woolley, and we ended with our niece Deborah delivering a creative version of Rule Britannia. Those with stamina went on after dinner to join in the Scottish country dancing, so there wasn't a dull moment. A scratch lunch the next day gave everyone more time to catch up with each other and relax. 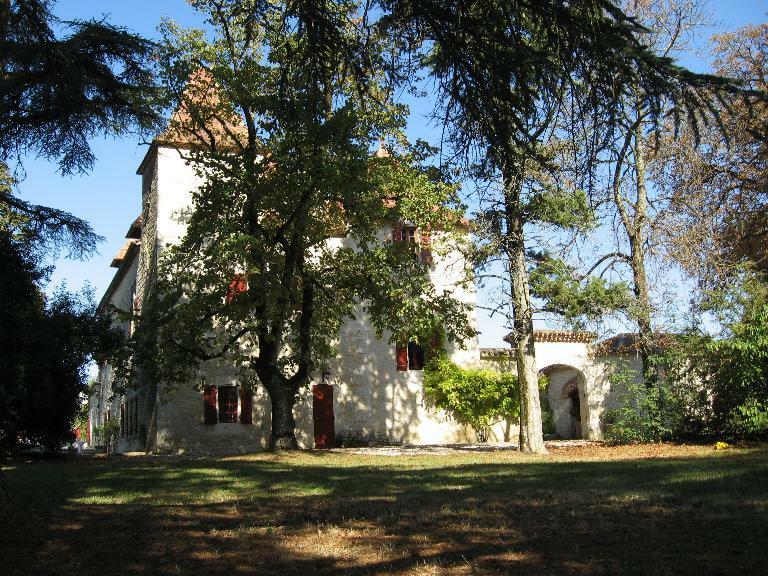 We used all 3 chateaux for family accommodation, and provided the rest with a long list of B & Bs, gites and hotels in the vicinity. More activity in 2012 included the finishing of work on Trichot's cottage, previously unused, but now providing 3 extra double bedrooms, and a living room with 'coin cuisine' - this has increased Trichot's capacity to 20+ , and can also be seen on its web pages. The extreme winter of 2011-12 had kept us all on our toes, but the only damage turned out be in little farmhouse Lafage, which we'd actually drained down completely. Unfortunately the plumbing turned out to have parts which didn't drain, so we found lots of bursts when we turned back on in the Spring. It was the cue for a new kitchen and the worktops and cupboards are greatly improved. 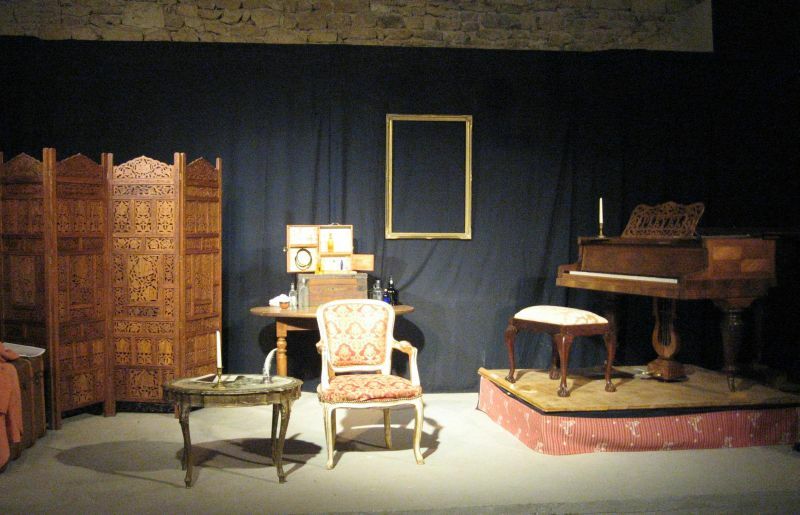 Finally we held a concert, for charity, in Trichot's barn at the end of September. It turned out to be great success, and we are holding another on Sunday 5th May 2013. 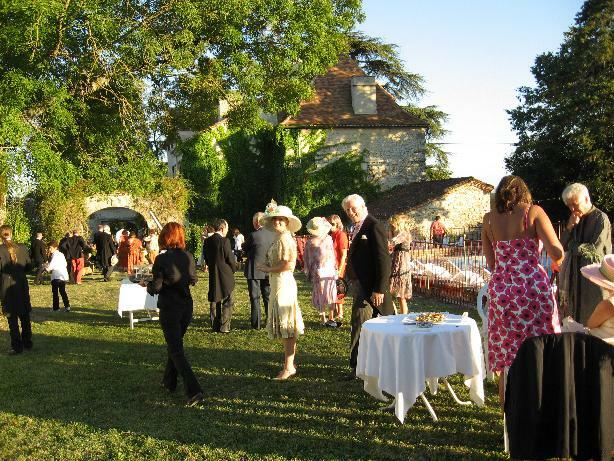 Details are at www.chateau-rentals.com/concert.htm so do come along if you are in the area. 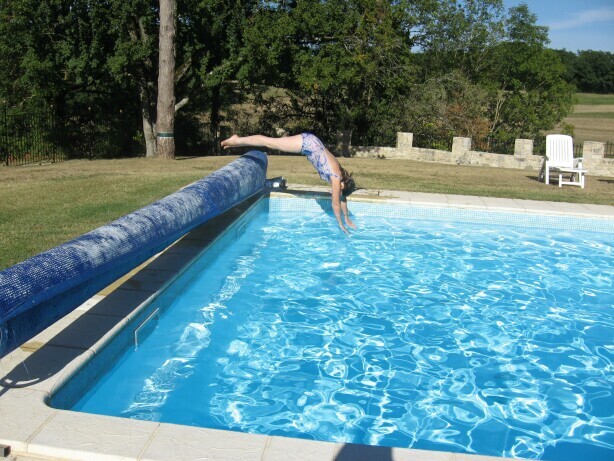 2011 has been a busy year for us - we were in France from February onwards, starting with skiing and quickly moving on to see 2 of the pools resurfaced and heat-pumps installed in all three pools. As a result we were swimming in 28C (80F) water from April until late October ! It really has made a big difference, helped of course by the exceptionally warm Spring weather. Projects included more garden furniture from the nice oak salveged from Cardou's barn roof restoration, and a long awaited resumption of some work started long ago to turn Trichot's unused cottage into extra accommodation. We shall soon have 3 more bedrooms and a self-contained living room/kitchen, so that Trichot will be able to expand to parties of 18 or more, if and when required. More work has started on the big barn at Trichot, to make it more easily usable for weddings etc - reflooring will effectively double its space, and we shall be christening it with a big anniversary party (for our ruby wedding) at the end of June. The very dry summer led us to worry about the vines, but there was apparently just enough rain at crucial times to ensure an excellent crop. The 2 Hectares at Trichot should produce about 10,000 litres. By the way, there is documentary evidence that the high level of tannin in Cahors wine is good for you! 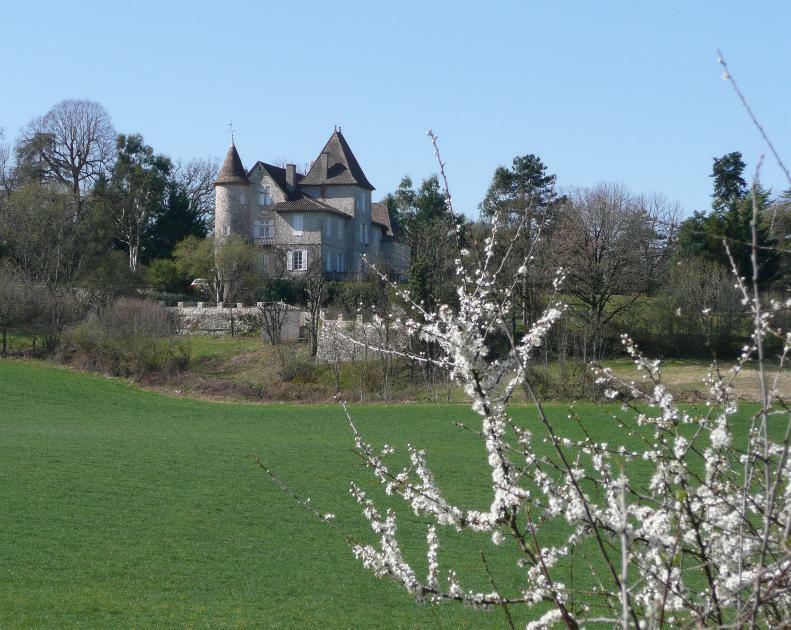 In 2010 we spent around 6 months in France, at one or other Chateau, as well as some frenzied activity at Lafage, after a long-term tenant had left. 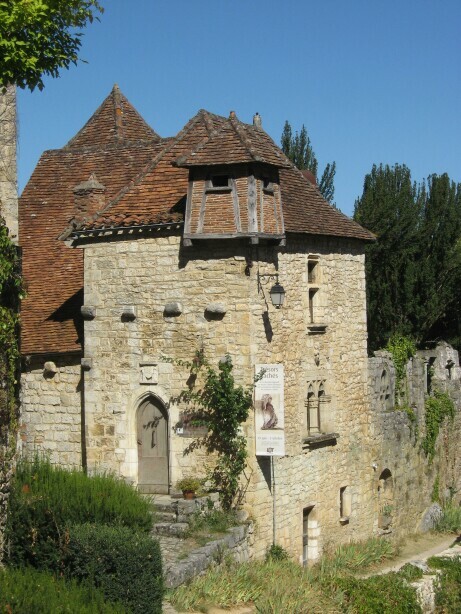 He was a Frenchman who stayed for over three years, while having a house built near Albas. I think he was very reluctant to leave, since Lafage's secluded position is so very hard to equal. The long winding drive up to it had to be resurfaced in 2010 as it was showing distinct signs of wear and tear. Also the local commune decided to resurface parts of Cardou's approach, and it will be a year or so before the pretty little weeds poke through the centre again ! 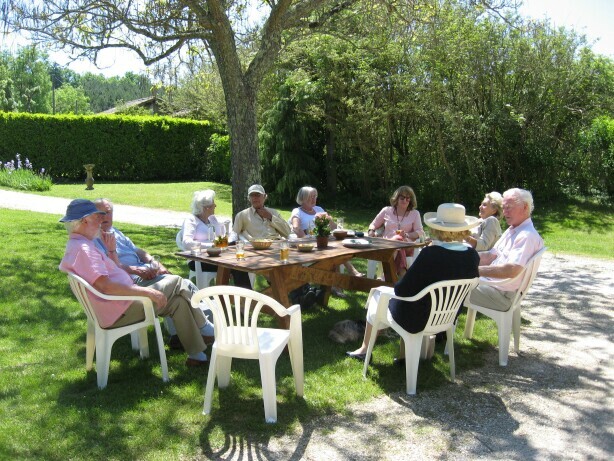 Joanna's parents, aged 84 and 88 respectively, came out to Cardou in the Spring. They like Cardou because they can have a big en-suite bedroom on the ground floor. Their stay triggered the installation of yet another satellite TV, in bedroom 2, just in time for Election night. This time they had asked to be driven out from England in their own car, which we did, so they could then be self-mobile while with us. Later on nothing would stop them from returning home entirely under their own steam. Well, he was a WW2 fighter pilot, after all, and they are both quite incorrigible. At 86 he was still DIVING into the pools. We had super weather for our house parties, one in May, the other in September. 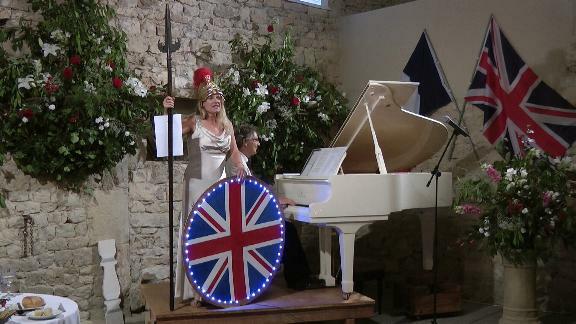 We were lucky to find Thezac holding a supper-evening in the village hall, complete with professional entertainment - a talented lady who gave us the full "Chanson Francais" treatment - all the Edith Piaf, Josephine Baker, Mireille Matthieu and others, even some ABBA favourites. 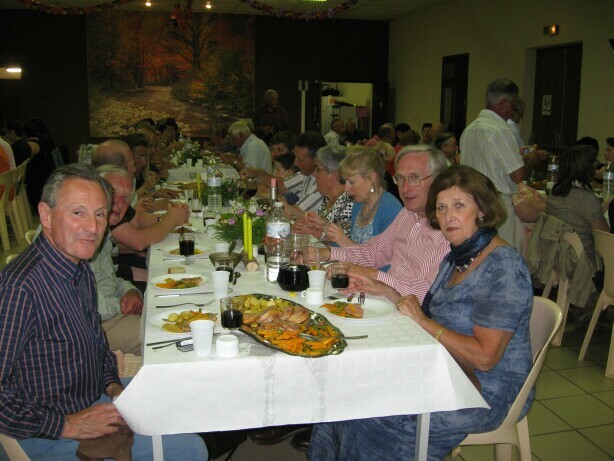 Wine flowed freely and the food kept coming - the French really know how to keep their tiny communities together. I think that our house guests have recovered from being dragged up onto the stage for some of the performance, and they certainly will not forget the evening. 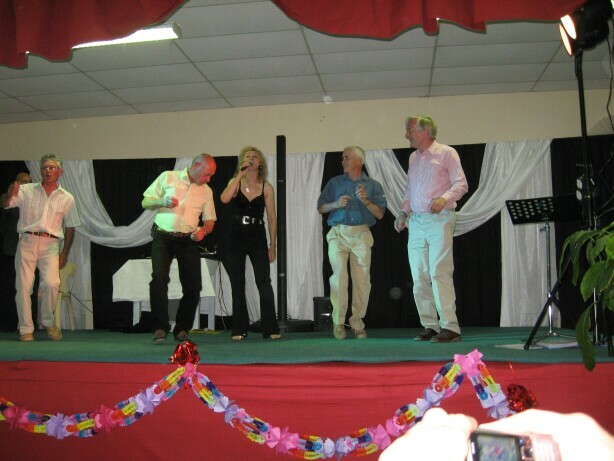 Thezac village hall - entertainment with delicious food & wine No hangovers, but why is Bill wearing a tie ?? 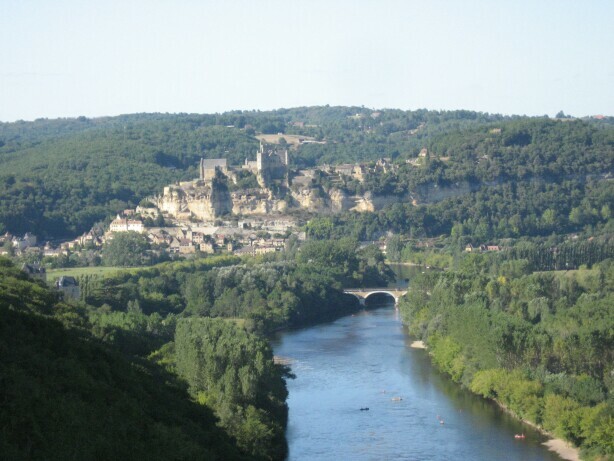 It is always a pleasure to take our friends to see some of the glorious sights along the Rivers Lot and Dordogne. 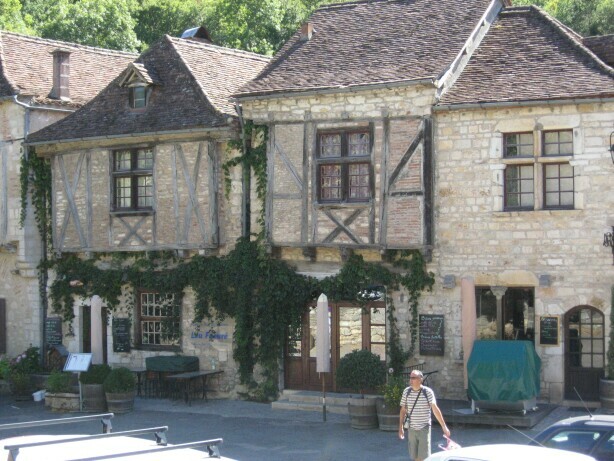 Saint Cirque Lapopie, Peche Merle, Chateau Bonaguil, Rocamadour and Castelnau are among the top favourites. 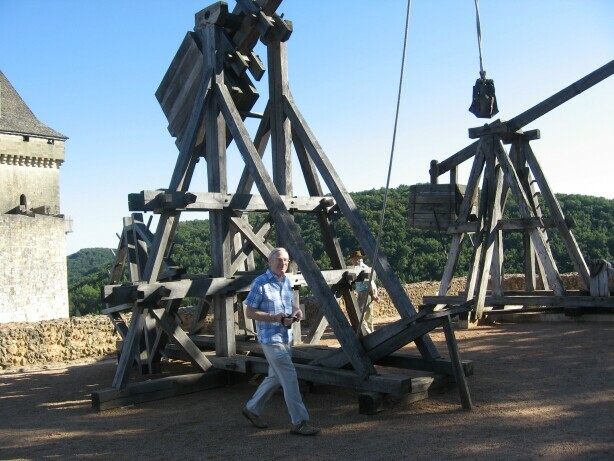 View of the enemy at Beynac-Cazenac, from Castelnau Castelnau's collection of siege engines are always ready for target practice ! 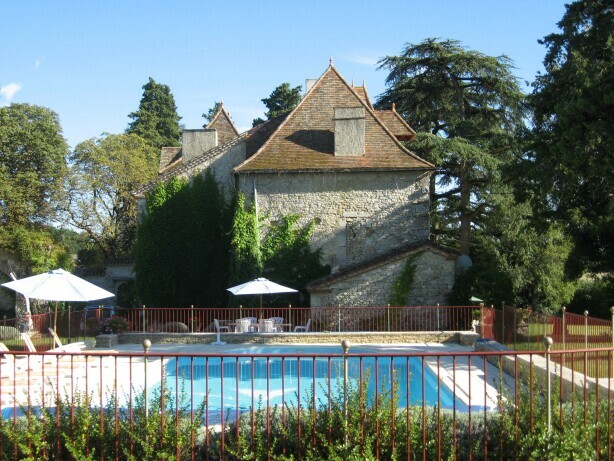 Swimming pools - following some exhortations from friends who live all year in France, we are finally succumbing to the installation of Heat Pumps, to extend the swimming season well into the Spring and Autumn. The pumps have arrived and our job for February (apart from skiing in the Alps) will be to have them installed and working. 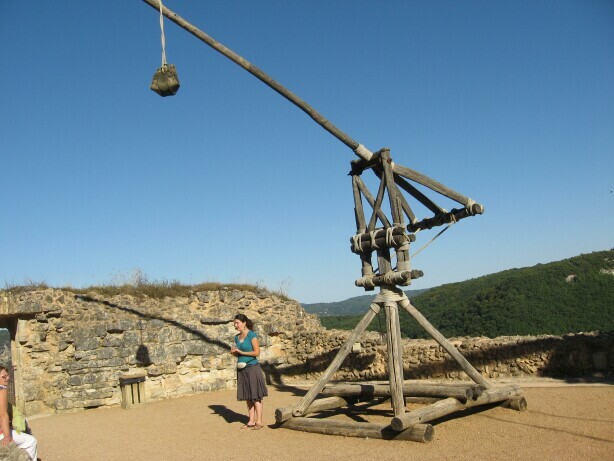 People keep asking for a photo of Joanna ! Finally our year was blessed with the arrival of two more super grandchildren, twins born in October (10/10/2010, so easy to remember). Soon we'll have to build an extension onto the Wendy-house. PS The new airport at Brive/Souillac has finally opened, and so far there are flights to & from London City airport and Manchester, as well as Paris Orly. It will be very convenient for Lamostonie, but stick to Bergerac for Cardou & Trichot. Trichot and Cardou have had their Tennis courts repainted (Cardou) and resurfaced (Trichot). Trichot's had lasted 20 years so it wasn't too surprising that a fairly major renewal was appropriate. Now they are both as good as new and a joy to play on, we think. Also Trichot's has at last got floodlights, which like the others, permit 5-a-side tennis in the dark after dinner. If you haven't tried this patented Stuart-Bruges sport, then you must. With 5 on each side, no-one has to run anywhere, and the game is to just keep the ball in play. After enough bottles of Vin de Tsar or Chateau du Trichot the experience is quite surreal. Minor variations are permissible, eg 6 on either or both sides. And talking of wine, Trichot's vineyard goes from strength to strength, under the care of Yannick Montel (son of the Maire of Thezac, proprietor of Domaine de Lions). We wouldn't like to admit to how much we bring back with us, to tide us over until the next visit ! Cardou has acquired a deluxe, huge, Wendy House, courtesy of Antoine Conde (Myriam's husband), who insisted that we had to have one for all the children, including our new grandson. It is a stunner, and contains its own mini picnic table. Some discerning smalls have apparently insisted on having all their meals inside it! Trichot's kitchen - now has new twin fridge-freezers, which are always great help with big parties, and catches up with Cardou and Lamostonie, which are each equipped with 2 large fridges. Trichot hosted weddings in 2007 and again in 2009, with the barn cleared out for dancing. Pianos - 2008 had been a big year for pianos - Trichot's nice upright got moved to Lafage and a beootiful Bechstein B Grand is now in the drawing room. 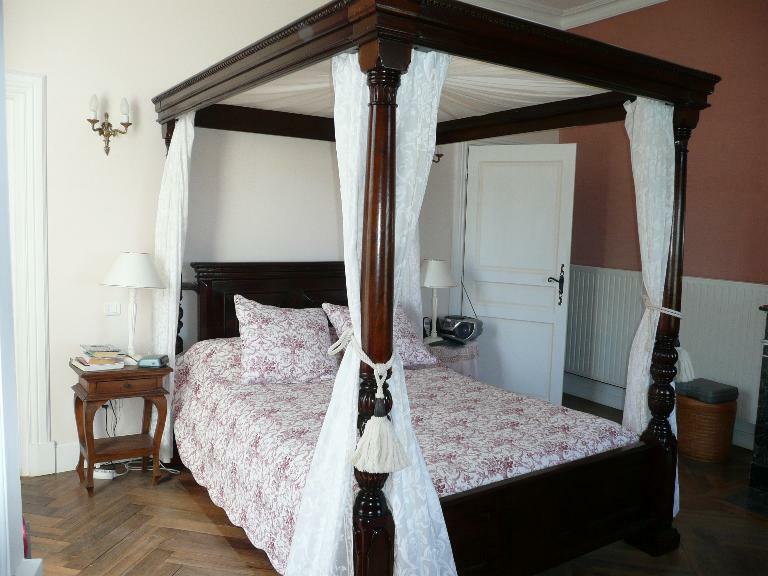 It is a superb example from around 1900, and the stone-vaulted ceiling certainly helps it sing. 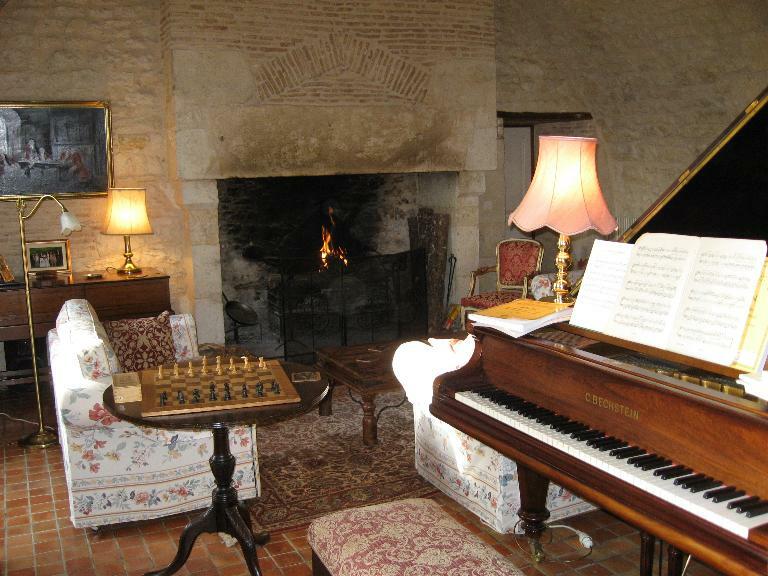 Lamostonie 'only' had one Bechstein and one Pleyel (both grand pianos), but when the opportunity to acquire another vintage Bechstein B came up, well, the Pleyel was moved from the music room to the drawing room, and another wonderful Bechstein moved in. Professional musicians find they cannot leave it alone, so we think we did the right thing. And the Pleyel, far from sulking, is actually sounding nicer than ever. It must have risen to the challenge, and prefers the acoustic of its new surroundings. Chopin used to prefer a Pleyel, and Cardou's sounds as good as ever, although the extreme heat this summer did give it a few palpitations. Karl Stice, the microlighting and paragliding piano tuner, thinks that the windows and doors must have been open, blowing hot air through it for days on end. 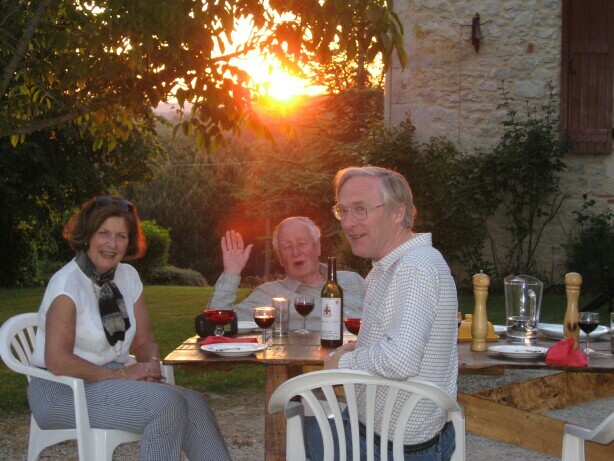 We are very fortunate to have Karl in the area - he used to tune for the rich and famous of Los Angeles, then he married a charming French girl, Antoinette, who wisely dragged him back to the Lot-et-Garonne. More - the vaulted dining room at Trichot had defied all thoughts of having curtains over the window-doors - until this year, when a brave attempt was made, using barn door hinges to hang them. It does give a cosier feeling as night draws in. Trichot's original huge garden bench-table has had new legs and new seats and probably new tops over the ages, but finally it had to go, and a new one has risen out of the ashes. Well not quite the ashes, but a major project to re-roof the giant barn at Cardou has liberated some decent timber, so Cardou got its Wendy House and Trichot got a nice new 10-12 seater barbecue table. Lamostonie has benefitted from a lot of tree planting, and the removal of some of the foliage near the swimming pool. Visitors from Canada have kindly brought over and planted four Saskatoon seedlings, from which we look forward to future harvests of berries. Lots of you have written or drawn lovely things in our house books, for which we are very grateful - many thanks. We wish you all the very best for the new year.